Okay, someone’s really into this cat stamp. I think they’re trying to hypnotize me. The cats were starting to look a little creepy. Why were their whiskers so lopsided? Where were their ears? Why were there four of them when we were only at part two? 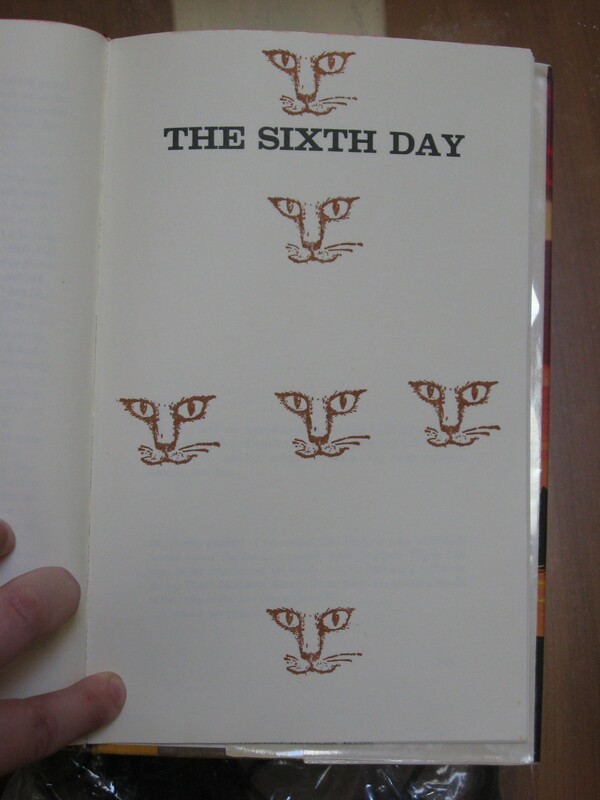 The placement of cat stamps continued to get more and more random…and somewhat menacing. Cat face cut in half?! 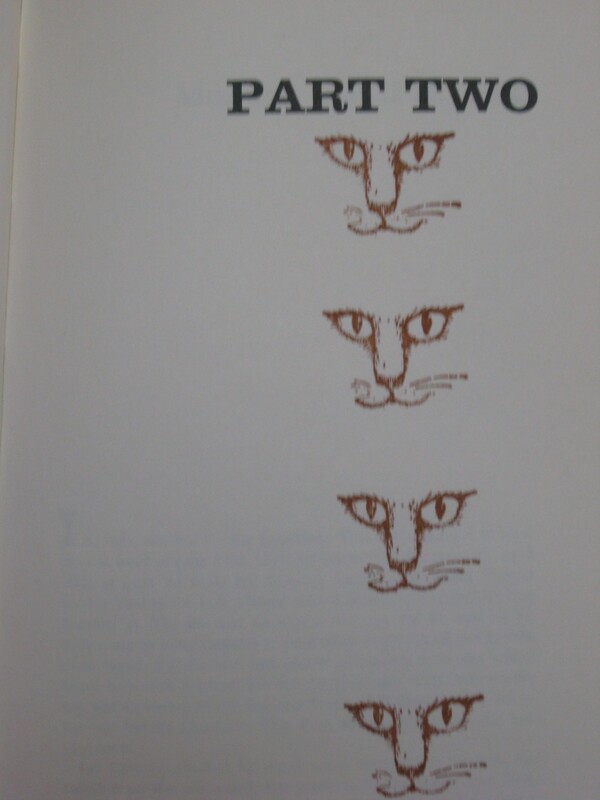 Please say this is just a blurry cat stamp. Not too long ago I went through a phase where many of the books I checked out from the library were…strange. 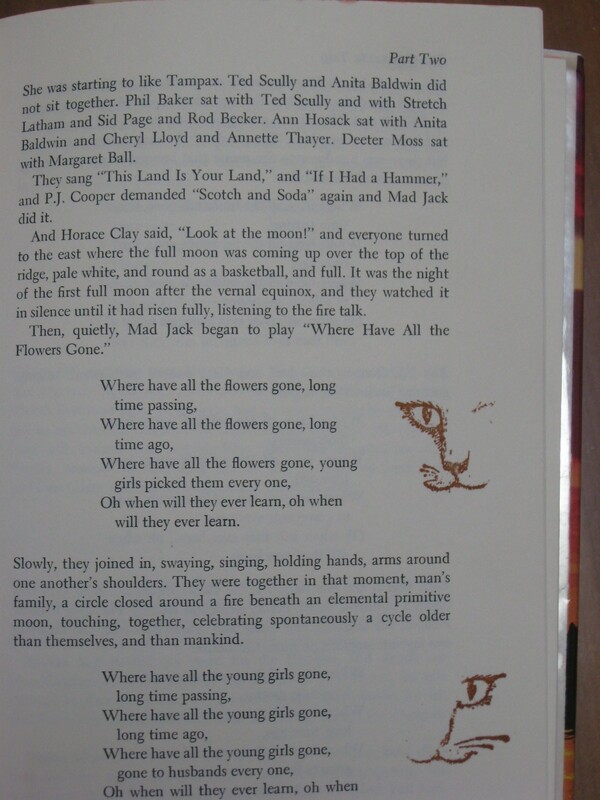 Previous readers had made odd annotations, added funny markings, or stuck weird things between the pages. 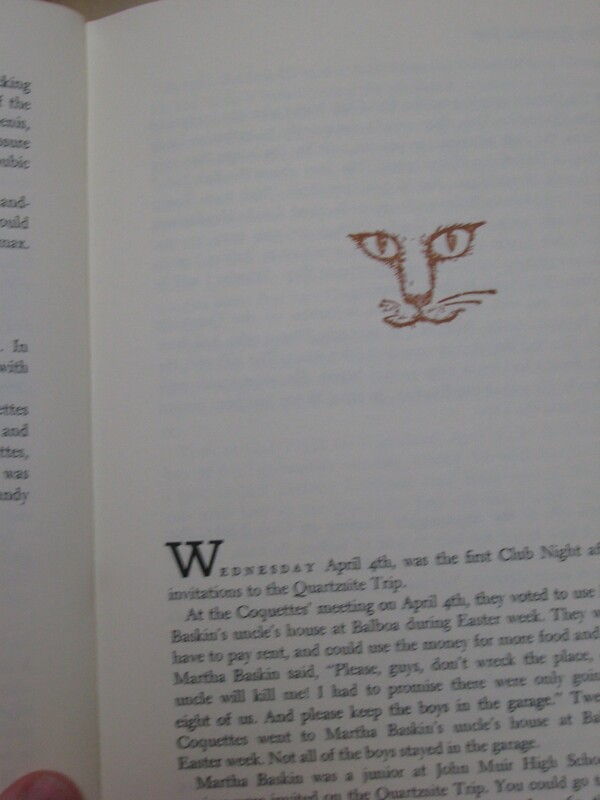 This is the first in a series of posts documenting Weird Things in Library Books. 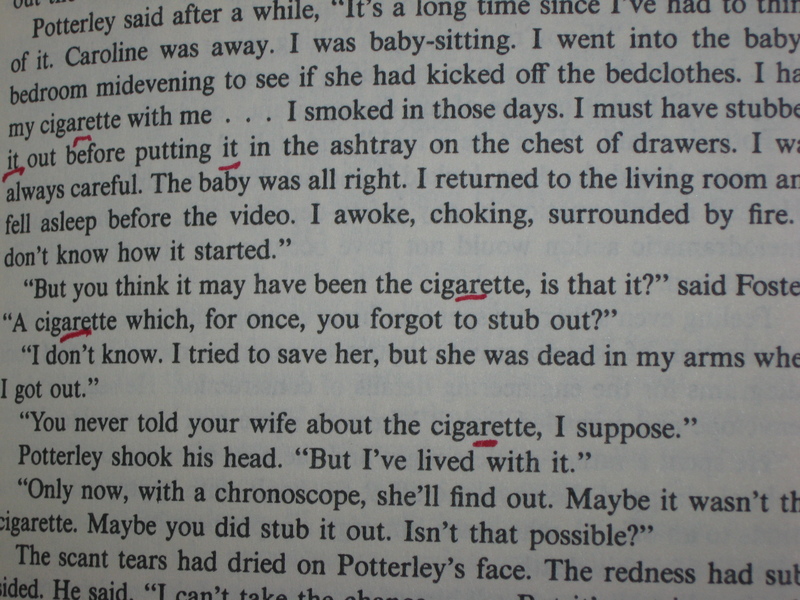 I looked closer and realized the previous reader had, indeed, marked every single reference to a smoking device–including pronouns (“it” and “its”)–in a somewhat angry looking red pen. 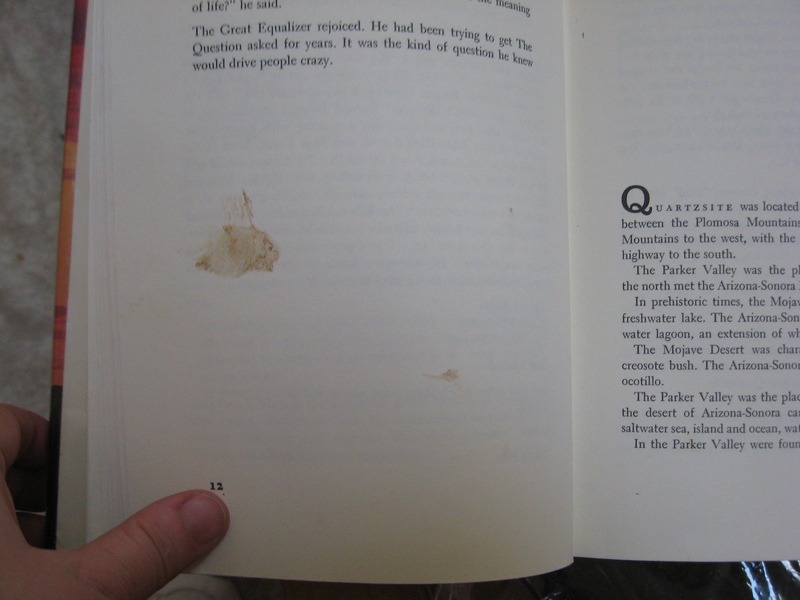 I flipped forward in the book and found other paragraphs that had gotten the same odd treatment. 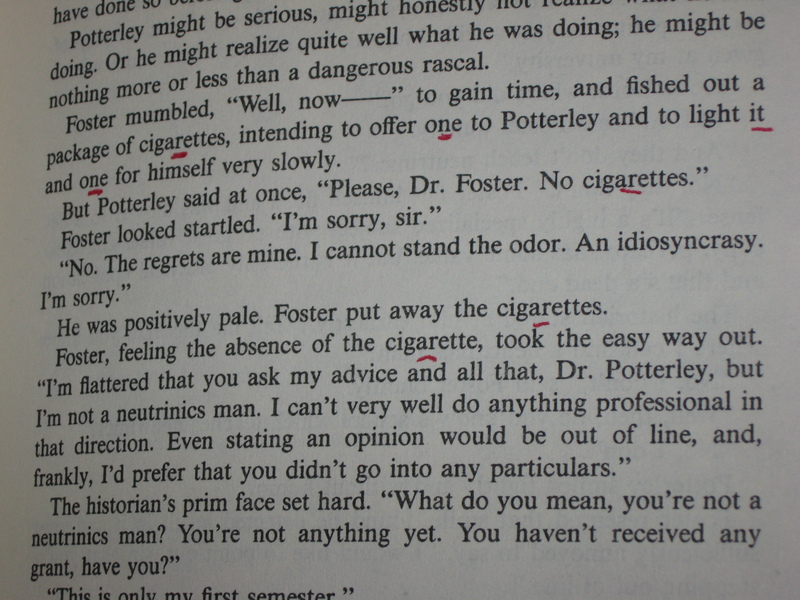 In one or two places, there was just a single “it” marked on a page, and an examination of the preceding text revealed that it was, indeed, a reference to smoking. 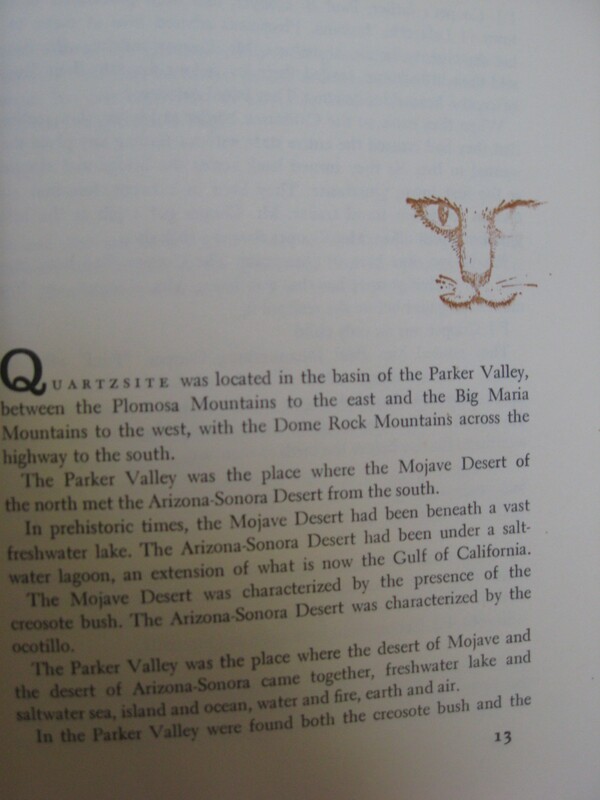 While I’m never in favor of defacing library books, I could perhaps understand this impulse if the book had a lot of gratuitous smoking in it. For instance, in Looking for Alaska, one of my favorite books, the characters do seem to be lighting up every time you turn around, and the centrality of smoking to the characters’ friendships and coming of age kind of makes you want to go buy a pack yourself. But that wasn’t the case here. 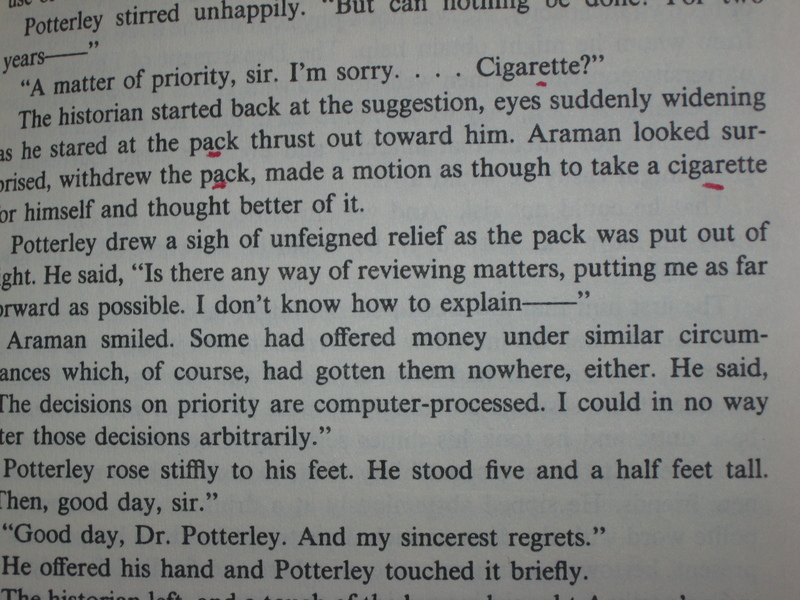 The Asimov book was 400 pages long, contained 30+ stories, and had perhaps 7 or 8 scenes in which someone was smoking. Smoking was just part of the background of the story–for instance, in the middle of a conversation, someone lights up a cigarette and smokes it thoughtfully. Poor Asimov was just using a talking head avoidance device–a writing technique where a conversation among characters is broken up a bit with details about them cooking dinner, or taking a bike ride, or whatever. Especially for a book of stories written in the fifties through the seventies, the amount of smoking was not notable. And yet someone read the entire book and carefully marked every single reference to the cancerous weed with an angry red pen. Why the attention to detail? Why the implied accusation? Was it an assignment for an anti-tobacco class? A nervous parent assessing the book for suitability for their child? Or maybe someone who had just stopped smoking and was going through a nicotine fit?